Last year, British coins underwent their first major redesign since decimal coinage was introduced in 1971. The Royal Mint held a competition to design the new coins. The winning entry was by Matthew Dent, and features the Royal Shield split across all of the coins from the penny to the 50p so that they fit together like a jigsaw to reveal the whole image. Perhaps it’s an indication of how little I use cash, but ever since the coins were first issued, I haven’t managed to collect a full set to put the jigsaw together. Today, I finally received change including the last missing coin: the 10 pence piece. One thing I have noticed is that in official photos of the new coins, they don’t put the shield together properly. 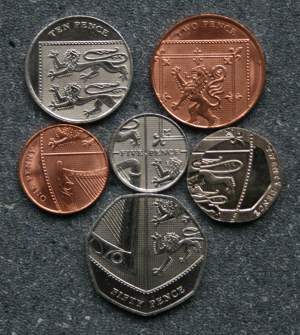 The Royal Mint’s own photo shows a slightly larger shield, formed by placing the coins further apart. While this still appears to be the correct shape for the shield, closer examination shows it is not quite right. The biggest clue is the second quarter, which shows the Scottish rampant lion. It is surrounded by a rectangular border (known in heraldic terms as a fleury-counter-fleury). In the Royal Mint’s arrangement, the edges of this border do not line up. To fit the image together properly, the coins must be touching, as in my photo. The three English lions are then equally spaced, and the Irish harp is slightly smaller. Quite why the Royal Mint display the coins like this I don’t know – I wonder if Matthew Dent has pointed it out to them. When the coins were launched, there was a bit of a furore in Wales because the Royal Shield does not feature an emblem directly representing Wales, as Wales had long been subsumed into England by the time of the Act of Union in the 18th century. This is slightly ironic given that the Royal Mint is itself based in Wales! The coins no longer have their values written as numerals, only in words. In the old design, the date on the 20p coin used to be on the reverse side, but is now on the obverse to match the other coins. It was revealed a month ago that some 20p coins have been minted with the old head side by mistake, so that the coin has no date at all. Such a coin – known a “mule” as it is a cross between two different coins, just as a mule is a cross between a donkey and a horse – is quite sought-after by collectors. Putting the coins close together causes lack of balance for visual sense. Because ten pence is smaller than two pence and at the same time one penny is smaller than twenty pence, you have to make right coins touching, meanwhile make the left coins further apart to fit the image together properly. The Royal Mint display the coins to look tidier.